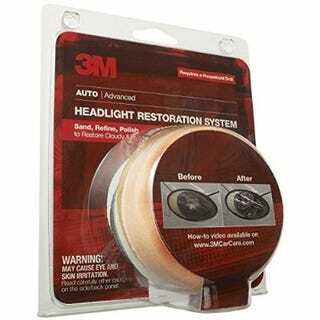 The headlamps on my S2000 are desiring of some polishing, and our Sienna is even worse, so I picked up two of these. The Sienna was the Guinea pig. The left lamp was noticeably worse than the right. This drill-based kit was far easier to work with than the hand-sanding kit I used last year. I was very conservative about switching out the discs, but even with large minivan headlights there were plenty, and I think I would have gotten better results by switching more often. I also see that more time and care at each level would have paid off in eliminating swirls and getting rid of more of the ambient scratches. The front corner of the light didn’t fit the curvature of the drill pad very well, and if I had cared about it, would have taken extra effort and thinking to get it as clear as the rest. I followed up the polishing with three coats of Natty’s Paste Wax. An excellent kit. For $15 it’s hard to argue with the low-risk, high-win value.